It’s safe to say we are all looking forward to sunny days and warmer temperatures after this past winter. Record-breaking stretches of below-freezing temperatures and back-to-back Nor’easters kept Pennsylvania residents on their toes – and then some. Despite the unpredictable weather, we’re happy to say that Eshenaurs customers were still able to save on energy costs, receive prompt fuel deliveries, and stay safe and warm. Now that we’ve made it through this winter, let’s bring on that spring thaw! 90 Years of Service. 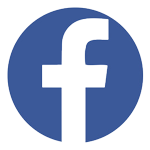 W.C. Eshenaur & Son, Inc. has been serving the greater Harrisburg, PA community for nine decades. We couldn’t have reached this important milestone without you! We are grateful for our customers’ continued support and look forward to meeting your home comfort needs for years to come. Invest in High-Efficiency. Upgrading to new high-efficiency heating or cooling equipment will not only improve your family’s comfort; it can also help lower your energy usage, which translates into lower energy bills. Spring is the perfect season to upgrade and save with seasonal specials. Stay Cool and Save. Beat the heat this summer with cooling equipment you can count on. Central A/C integrates seamlessly with existing ductwork to provide even whole-home cooling while cutting energy costs. No ductwork? No problem! Ductless mini-split systems are the perfect solution, offering zoned room-by-room cooling from sleek, unobtrusive units. As you begin to prep for the warmer months ahead, know that Eshenaurs is right there with you. We will continue to add technology advancements, technician trainings, and premium products to our offerings to uphold our commitment to your home comfort throughout 2018 and beyond. Ranked #1 in reliability, American Standard Heating & Air Conditioning is the industry leader in home comfort. So reliable, in fact, that you never have to think about it. Now you can save even more with the SET THE STANDARD sales event! Learn more about instant rebate offersat americanstandardair.com/salesevent or call us at (717) 236-5031 for details. *See your independent American Standard Dealer for complete program eligibility, dates, details and restrictions. Special financing offers OR instant rebates from $100 up to $1,000 valid on qualifying equipment only. Offers vary by equipment. All sales must be to homeowners in the United States. Void where prohibited. 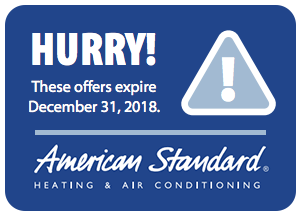 See your independent American Standard Dealer for complete program eligibility, dates, details and restrictions. Special financing offers valid on qualifying equipment only. All sales must be to homeowners in the United States. Void where prohibited. **The Wells Fargo Home Projects credit card is issued by Wells Fargo Bank, N.A., an Equal Housing Lender. Special terms apply to qualifying purchases charged with approved credit. The special terms APR will continue to apply until all qualifying purchases are paid in full. The monthly payment for this purchase will be the amount that will pay for the purchase in full in equal payments during the promotional (special terms) period. 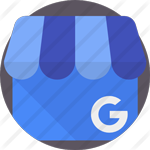 The APR for Purchases will apply to certain fees such as a late payment fee or if you use the card for other transactions. For new accounts, the APR for Purchases is 28.99%. If you are charged interest in any billing cycle, the minimum interest charge will be $1.00. This information is accurate as of 3/13/2018 and is subject to change. For current information, call us at 1-800-431-5921. 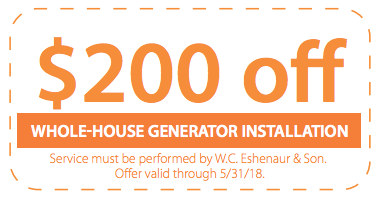 Offer expires 6/30/2018. Whether you stay cool with central air or a ductless mini-split, it’s critical to schedule annual maintenance to ensure your system runs efficiently throughout the summer. Join us in celebrating our 90th year in business by saving money! BEAT THE SUMMER RUSH! 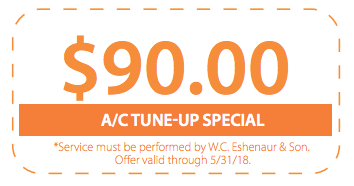 TAKE CARE OF YOUR A/C TUNE-UP BEFORE WARM WEATHERIS HERE TO STAY – SCHEDULE MAINTENANCE TODAY! Just because temperatures are rising in the Northeast doesn’t mean storm season is over. In fact, spring and summer can bring on some pretty wild weather, which can often lead to power outages. Weather any storm with a Generac® home generator. Don’t wait until you lose power to realize how valuablea whole-house generator system can be. Call us at (717) 236-5031 to learn more! No heat in the middle of the night? A/C breakdown on the hottest day of the year? No sweat! When you enroll in one of Eshenaurs’ tailored heating or cooling service plans, you gain peace of mind all year long. Our Heating and Cooling Maintenance Plans are designed to keep your HVAC systems running smoothly and offer premium support, likepriority service and parts discounts, just in case. 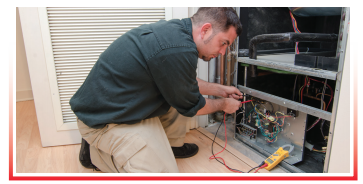 Learn more about Heating and Cooling Maintenance Plans. W.C. Eshenaur & Son, Inc. is proud to celebrate 90 years in business serving Harrisburg, PA and the surrounding communities. Over the years, our services have expanded to meet the growing home comfort needs of our customers. But, one thing has never changed: our commitment to you. Eshenaurs is the local home comfort provider that you can count on for propane, heating oil delivery, plumbing, HVAC systems, professional service, and more. We will always be here when you need us.